Some Easy to Follow Tips to Sell more Retractable Banner Stands. Showcase your customers’ company information or personal message with Victor Printing’s retractable banner stands. Compact and easy to use, a retractable banner stand is an effective and attention grabbing marketing solution for any trade show, business event or storefront. Retractable banners bring the focus to your customer’s business. Featuring a fully customizable design and message of your choosing, you can use retractable banners to really draw the attention your customers need. Sell more retractable banner stands by targeting new businesses promoting their grand openings, retailer point of purchase displays, universities promoting college recruitment, trade show booths and more! Another source of business is your local sports teams, country clubs, golf courses; anyone who needs temporary sponsor recognition signs. Sales organizations need portable, lightweight stands for presentations at convention centers, trade shows, demonstrations, seminars and workshops, perfect to direct people to their meeting places. 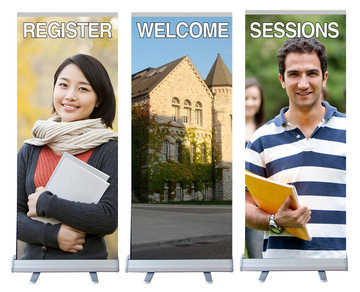 Retractable banner stands are great for promotional events, trade-shows, or any of your customers’ advertising needs. If you or your customers need an affordable, attention grabing sign for your business or organization, look no further than Victor Printing! « How one Metropolitan Museum got 500 New Members to Join in 10 Days!